One very interesting festival I came across was called the Bathukamma, and it is celebrated in the state of Telangana. This is a floral festival. And celebrated on the Bhadrapada Amavasya or better known as Mahalaya Amavasya in the Hindu calendar. This usually falls in the September- October months of the Gregorian calendar. Starting on the Mahalaya amavasya it is celebrated through Navaratri and culminates on Ashwayuja Ashtami, which is called as Saddula Bathukamma or Pedda Bathukamma to the rest of the subcontinent this, is the Durgaasthami. The festival marks the beginning of Sharad Rtu, the early winter. The Bathukamma is followed by the Boddemma which is the 7 day festival that marks the end of Varsha Rtu or the rains. Bathukamma is a beautiful flower stack arranged with different unique seasonal flowers, most of them with medicinal values. They are arranged in seven concentric layers in the shape of gopuram. Bathukamma actually means Mother Goddess comes alive. This is the festival of feminine felicitation; women dress up in traditional sari combining it with jewels and other accessories. Teenage girls turn up in Pavada (ankle length skirt) or the half sari which is the pavada draped with a second cloth like a sari. The first five days sees the women cleaning their courtyard called Vakili in Telgu with cow dung and mixed with water this forms the ground base over which mangala aakara or muggu patterns are drawn with rice powder. (For more log on http://www.ikolam.com) For the first five days Bathukamma is prepared with cow dung, small conical lumps are made and arranged in Vakili. It’s not that the men are let off, the men gather flowers from the wild plains like Celosia, Senna, Marigold chrysanthemum, Lotus, cucurbit lives and flowers, datives leaves and flowers, these bloom in various vibrant colours across the uncultivated and barren plains. Preparing the Bathukamma is a folk art women start preparing the Bathukamma from afternoon, they cut the flowers and leave little length base, some do dip Gungu (Celosia) flowers in various vibrant colours some are scented. These are arranged on the Thambalam spread with big leaves and decorated with either Lotus or Pumpkin flowers on the stack along with Gouramma. 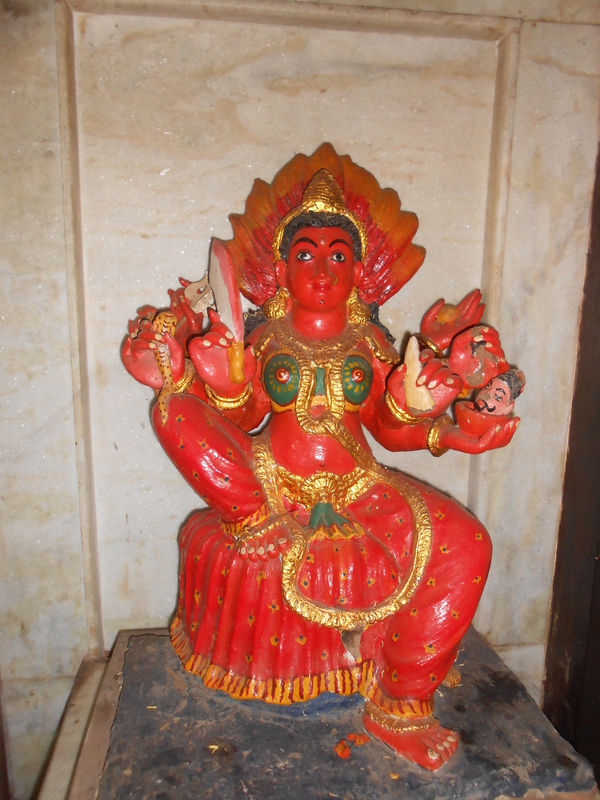 Gouramma is the symbolic idol of the mother goddess made of turmeric. Interestingly Kalidasa describes early winter as the golden bedecked bride since Nature manifests in hues of gold. This floral arrangement curiously does not disassemble in water. It floats a while in water and then drowns. The Naivedyam or food offered to the goddess is prepared by young girls or children for the first eight days. On the last day the saddula Bathukamma, the women take part in the preparation too. The naivedyam is as follows. The first day that is the Engli Pula Bathukamma is on the day of the new moon the Mahalaya amavasya or the Pethara amavasya sesame seeds, Biyyampindi (rice flour) or nookalu that is coarsely ground wet rice is offered. On Atkula Bathkamma the atkulu or flattened parboiled rice with bland boiled lentils and jaggery is served. The third day that is the Muddapappu Bathukamma the Muddapappu or softened boiled lentils, milk and jaggery is offered. Nananesina biyyam or wet rice with milk and jaggery is offered on the Nanabiyyam Bathukamma on the fourth day. On the 6th day that is the Aligina Bathukamma no food offering is made. On the 7th day that is the vepakayala Bathukamma rice flour shaped into the fruits of neem tree is deep fried. On the 8th day is the vennamuddala Bathukamma when the naivedyam is made of nuvvulu or sesame –butter or ghee and jaggery. 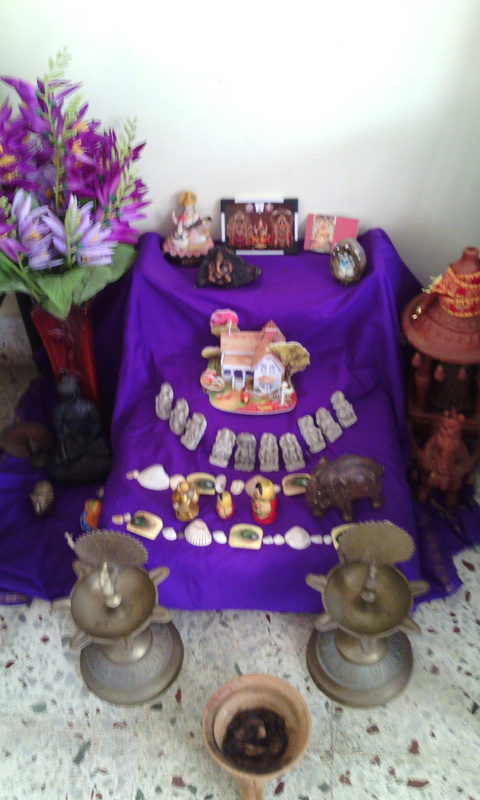 Bombe Habba– display by Dr.Tanvi M.D. On the 9th day is the Saddula Bathukamma this is also the day of Durgashtami. Five types of cooked rice dishes are offered here. The sadii- or curd rice, chinthapandu pulihora saddi –the tamarind rice, nimmakaya saddi-the lemon rice, the kobbara saddi- the coconut rice and the nuvvula saddi the sesame rice. The 9th day the day of Saddula Bathukamma is when the Bathukamma is dispersed to water. This is a visual treat. The Guramma or the turmeric Gowrie is taken back from Bathukamma before immersion every married woman applies a paste of this on her mangalasutra. Batukamma festival has very deep roots in Telangana.One should accept that the tradition united people ,irrespective of all differences, to fight for separate statehood and which got materialized too.Good post.All the best. Previous PostPrevious The first step.